Outdoor extensions like timber decks are prone to constant exposure to harsh climates and environmental elements. While these structures are built to withstand the seasonal changes in each state, regular monitoring is important, especially in the colder months. One cost-effective way to keep your deck free from dust and clutter is through regular cleaning. Scrubbing the floor is a common method to ensure that the wood has no stains or mess. Cleaning solutions with bleach-free formula are effective to use to help protect the deck and remove any form of mould. Dirt and leaves can also make their way to the platform. Sweeping them away is needed to prevent small particles from forming into the gaps and crevices. A bristled brush is also good to utilise to reach the tiny spaces between the boards. In some cases, high-pressure cleaning is the answer to your problem. A water hose can also help you accomplish your objective. However, this approach requires extra care to avoid cracks and structural damage. It’s not recommended for older decks as they are less sturdy compared to newly built structures. 2. Assess its current condition. Loose boards and nails might be obtrusive at first glance. But as you begin to check its condition, some issues might instantly appear. Does the structure need urgent fixing? Looking for signs of decay which can result in holes and crevices is essential to conduct preventive measures. Wood filler is advisable to use for smaller problems like cracks. 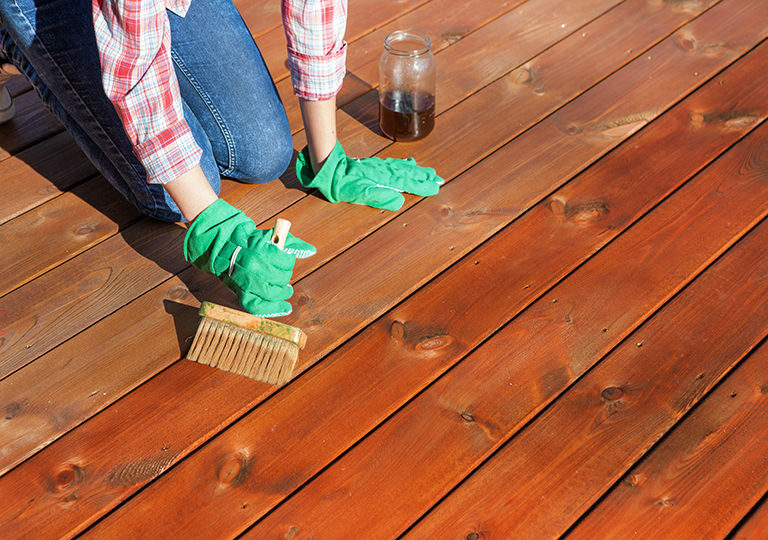 Before it infects other wood panels, you can visit your local store to look for durable deck sealants that can help stop the spreading. Hailstones can also destroy timber decks in some states like New South Wales and Queensland. Covering it with a thick tarp is necessary to provide a protective barrier between the boards and snow heaps. 3. Stain your timber deck. After rounds of cleaning, inspection and repairs, staining the platform is a great way to prevent moisture from permeating into the wood and give it a more refined look. For old or newly repaired structures, stripping is done to remove the old finish and apply a new coat. A standard shade is good when choosing a suitable colour for deck finishes. Performing a test procedure is needed to observe if the selected stain finish will work well with the wood. Getting a piece of split timber is advisable to see if the product is a perfect choice. Waterproofing is also an option. As a rule of thumb, it’s good to monitor the weather and temperature in your area to help you determine if it’s the best time to start the procedure. Will there be heavy rains or impending storms in your area? A constant threat of rainfall will impede the drying process. Considering the climate condition still rings true and effective before commencing the actual work. Whether your timber deck is newly constructed or has been built for ages, investing in water-repellant products is a wise move. Not only is it beneficial in restoring the structure’s appeal, but it also keeps your deck from rotting and losing its durability. Are you planning to have it thoroughly examined? Aside from your finances, some factors to consider are the current bouts of humidity in your area and other local conditions. Another aspect to check is the level of sea air within your location to ensure that water-resistant materials are valuable to use. Don’t let the external elements ruin your timber deck. If you must, set a regular schedule for maintenance to prevent it from early deterioration and serious damage. When there’s a need to hire a business that provides deck restoration and maintenance services, make sure to check the credentials along with their sample works to choose the right professional. Pay attention to what you can do and leave the maintenance and repair tasks to the experts. HIREtrades is a one-stop online marketplace for connecting consumers and businesses, covering 200+ trades and serving all states across Australia. Visit our dedicated Decking page or Get A Quote by filling out our quick and easy form.